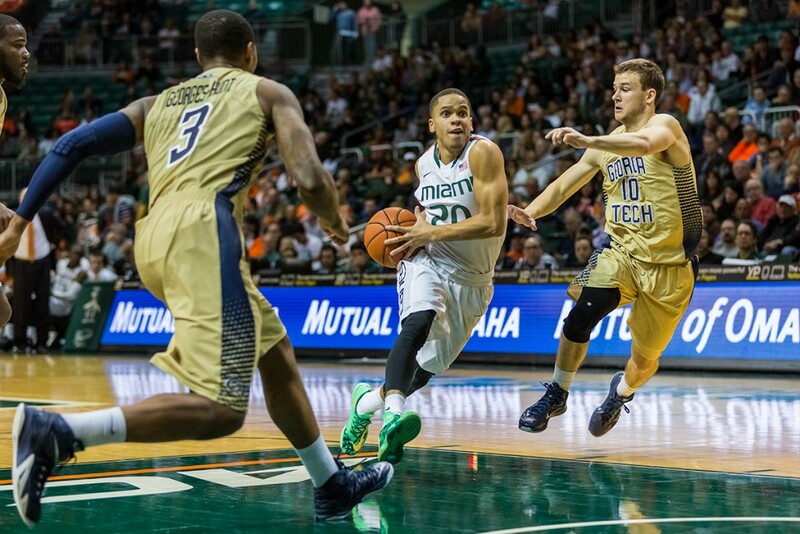 UPDATE: Coach Jim Larrañaga confirmed that DeAndre Burnett will also be transferring from the program. After missing the NCAA tournament and finishing as the controversial runner up in the NIT, the chatter surrounding the Miami Hurricanes basketball team centered on the team’s strong finish to an up-and-down season and the optimism surrounding 11 scholarship players returning. Now, only nine are slated to return, now that Belgian combo guard Manu Lecomte and fellow guard DeAndre Burnett have elected to transfer from the University of Miami. Coach Jim Larrañaga has confirmed these reports. Lecomte was a key cog in the Miami machine this season, despite its inconsistent nature, and provided solid guard play in the wake of Angel Rodriguez’s prolonged slump to help carry the team at times. The Belgian sophomore, nicknamed “Waffles,” dropped 23 points in Miami’s marquee win of the season, a 90-76 win over eventual national champion Duke. Lecomte’s performance that day was vital in ending the nation’s longest active home winning streak in Division I basketball, which is no small feat at Cameron Indoor Stadium among the Cameron Crazies. Next season, the guard rotation was to be led by Angel Rodriguez, Sheldon McClellan and Davon Reed, with Burnett, Ja’Quan Newton, James Palmer and Lecomte playing in reserve roles. There were not enough minutes to go around, it seems. For the year, Lecomte averaged 7.9 points in 22.4 minutes a game. Lecomte’s playing time had dwindled since his freshman campaign, in which he played 28 minutes a game. The sharp-shooting sophomore shot better from beyond the arc than he did from the field, shooting 46 percent on three-point attempts while just 43 percent overall. His playing time shrunk with the emergence of Newton. Newton, a freshman from Philadelphia and also a combo guard, seems to have more upside than Lecomte. Newton is more athletic and a better defender, and often creates his own shot. Lecomte, meanwhile, is a 5-11 guard who relies on others to create his own shot and is a lesser ball handler than Newton. Lecomte must sit out the 2015-2016 season due to NCAA transfer rules, but has two years of eligibility remaining.